Tonight, the City of Boston is getting lit. 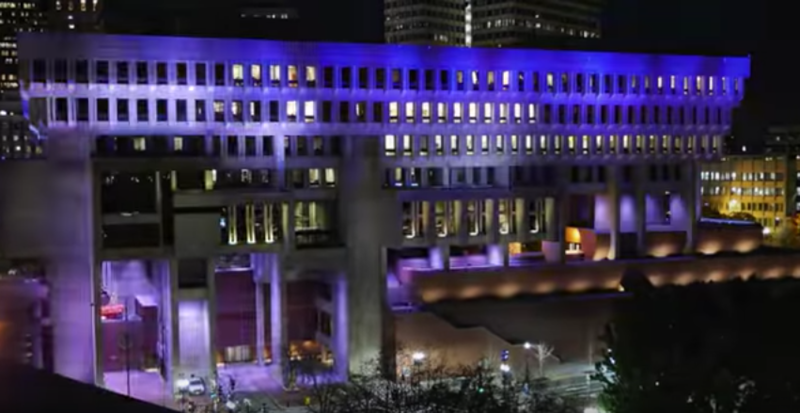 The city is opening up City Hall Plaza, the front lawn of Boston’s best-known (and most-hated) Brutalist building, to food trucks, carnival style–games, and beer-swilling citizens to celebrate its latest attempt to gussy up Government Center. Attendees at Light Bright Beer Garden, this year’s last Beer Garden on the Bricks, will witness a colorful light display on the angular concrete massing so deliberately stripped of ornamentation. If early online comments on the event are any indication, bright primary-school colors might not be enough to make jaded Bostonians love architecture firm Kallmann McKinnell & Wood’s difficult creation. YouTube user Shaun Beacham writes: “We’re sorry the building looks like a prison, but we put some lights on it and now it’s a colorful prison!” A few pints in, Shaun, and it might not look so bad! The event begins at 6:30 p.m. tonight at City Hall Plaza. Can’t make it? Follow #LightBrightBOS on Twitter, Facebook, and Instagram.